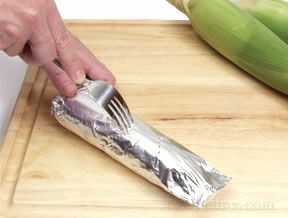 Peel back the husk without removing it from the corn cob. 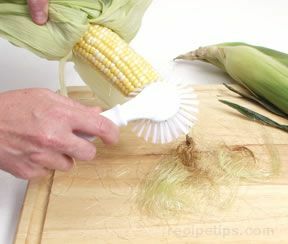 Remove the thin silk that runs along the kernels of the corn. Remove excess silk with a vegetable brush or with a damp paper towel. Fold husk back. Secure husk with kitchen twine. 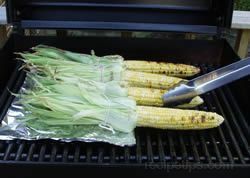 Soak the corn in water for 1 to 3 hours before placing on the grill. 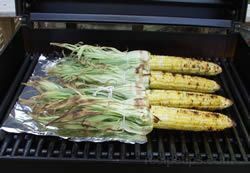 Place prepared corn on the grill directly over medium heat. Cook 20 to 30 minutes, turning frequently throughout cooking time. Corn is done when it starts to steam. 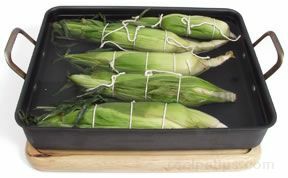 When done, the husks will be charred but the corn inside the husks will be sweet and tender with a nice roasted flavor. 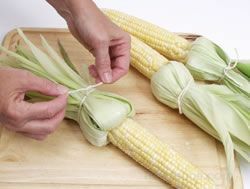 Using a kitchen scissors, trim excess silk from the end of the corn. Soak corn in cold water for a minimum of 1 hour. Before placing on grill, shake to remove excess water. Grill for approximately 25 to 30 minutes, turning frequently. 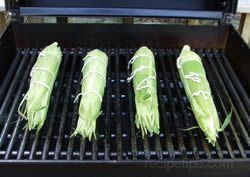 The husk and any remaining silk is removed after grilling. Use heat resistant gloves to protect your hands. 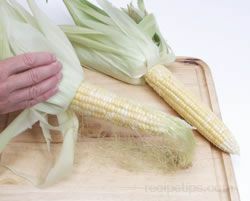 Shuck the corn as shown above by peeling back the husk and completely removing it. 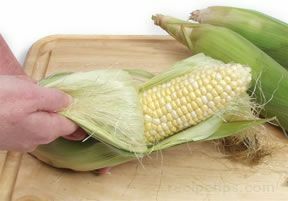 Remove the thin silk that runs along the kernels of the corn. Remove excess silk with a vegetable brush or with a damp paper towel. Break or cut off any excess corn stalk. Wrap each individual ear in aluminum foil. Spread softened butter on the ear and then season as desired. After spreading butter and seasoning, wrap each ear tightly with the foil. 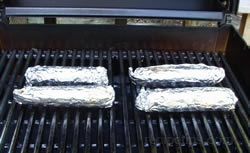 Puncture the foil to allow excess steam to escape while grilling. 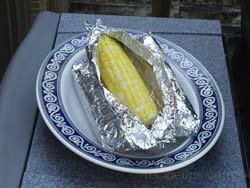 Place the foil wrapped corn on the grill directly over medium heat. Cook for 20 to 30 minutes, turning frequently throughout cooking time. 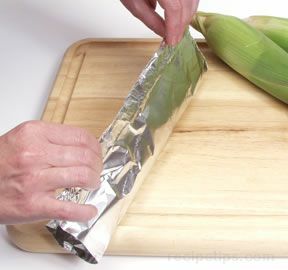 Remove corn from the grill and carefully open the foil wrap. Check corn for doneness. If it is not done, wrap the ear back up and place it back on the grill for 4 or 5 additional minutes. Carefully pull husks back off from the corn but do not detach it at the end. Remove the silk. 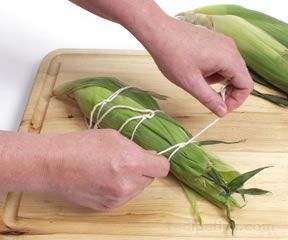 Tie the husks with string to hold them back and form a handle at the end of the ear of corn. Mix 6 tablespoons of softened butter with 1 clove of garlic (minced) and 1 to 2 tablespoons of minced parsley. 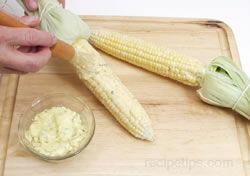 Stir butter mixture until smooth and then spread lightly on the ear of corn. 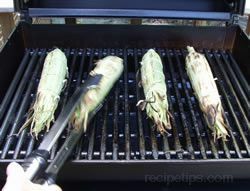 Place corn on the grill directly over medium heat. 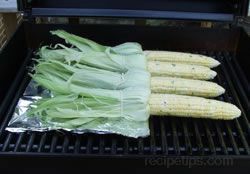 Arrange so that the husks hang off the edge of the grill or place foil under the husks in the area the husks will be placed. This will prevent them from burning. Cook for 10 to 12 minutes. Turn the corn frequently during the cooking time. Brush ears with the remaining butter mixture as they are cooking. When the corn is done the ears will be golden brown. Remove from the grill and serve while warm. 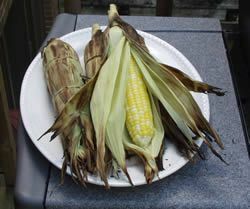 Do not add salt to the water when cooking sweet corn because the salt will toughen the corn. Add a little sugar to the water to boost the flavor. 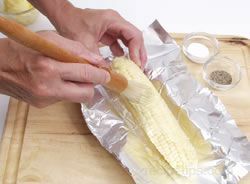 To cook a couple of pieces of sweet corn in a hurry, place two or three ears in a resealable plastic bag and add 1 tablespoon of water for each ear. Leave a slight opening in the bag and cook on high in the microwave for 2 minutes. Check for doneness and if not done, cook for an additional 30 seconds. Sweet corn will lose its sweetness much faster if stored at room temperature compared to storing in the refrigerator. It is best to eat it as soon as possible after it has been picked. Two to three medium ears of corn are equivalent to approximately 1 pound, depending on ear size. Two medium ears equal approximately 1 to 1 1/2 cups of kernels. If harvesting your own sweet corn, it is best to pick it early in the morning and eat it as soon as possible. If not cooking it soon after it is picked, store in the refrigerator until ready to cook.